You’ve spent hours researching, writing, and polishing your latest post. You’ve promoted it on social media and optimized it for SEO, but no matter what you do, the clicks just aren’t coming in. So you decide to give up and move on to the next topic, abandoning all your hard work to the virtual dustbin that sits in the corner of your site’s forgotten content. 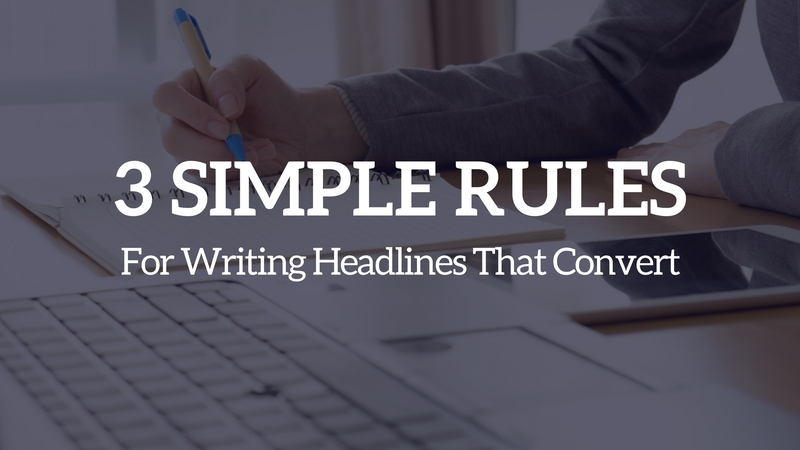 Your content just needs an eye-catching headline to pull readers in, and these 3 simple rules will make writing one easy. So when someone decides to click on your blog post title and read your content, they’re being generous with their limited time. People who read your content should feel that they’re getting something of value out of it, and your headline should assure them that reading the rest of your post won’t be a waste of their time. Vague headlines do your content an injustice. At best, they undersell the impact of your writing; at worst, they make readers confused about its subject. By reading it, we know we’ll learn how to save money. But we don’t how much money we’ll save and how much scrimping it will require of us. Everyone likes having more money, but the best headlines don’t target everyone. They target a narrower audience. Great headlines don’t just explain what your article is about; they tell what you’ll get out of it by reading it. Make it obvious to the reader what benefit your content will provide. Either way, make sure that readers don’t just get a summary of your content through your headline. Let them know what impact the content will have by showing them a benefit. Your headline is the first interaction that readers will have with your content and possibly your brand. As the first point of contact with your readers, your headline will set expectations for what your content will provide for them. If your content doesn’t fulfill the expectations set by your headline, readers aren’t likely to finish your post, and they won’t follow you through email or social media subscriptions. First of all, that means you must avoid writing deceptive headlines that don’t fit your content. Don’t resort to bait-and-switch tactics, even if you think your subject is “too boring” for an interesting headline. Readers are smart. They’ll know if your content is trying to deceive them, and they won’t appreciate that you’ve wasted their time. If your content doesn’t measure up to the expectations set by your headline, make your content better. Invest more time, research, and creativity into your content so it can be worthy of a clickable headline. Secondly, your headline should fit your audience. We covered this a little in rule #1, but let’s take the concept a bit further. A headline that fits your audience is targeted to their needs and preferences just like the rest of the content. Of course, headlines are short, so there’s only so much space for adding audience personalization like this. At the very least, make sure your headline isn’t a mismatch for your audience. Millions of blog posts and online articles are published every day. If your headline doesn’t strongly grab your readers’ attention, your content is likely to get lost in the crowd. The answer is obvious: make sure your headline is actually interesting. Question-based headlines work well for a couple reasons. First, they make readers curious about what the answer is. Second, they get readers engaged in your content before they even read it by making them think about their own answers. Headlines with numbers get more clicks because they make your content seem structured and digestible. They also add specificity, which helps readers better gauge the value they’ll get by reading the content. Some psychologists say that FOMO is a modern-day equivalent of ancient man worrying that his neighbors are finding all the best berry-picking spots. Whatever the reason, people certainly click on headlines that underscore the successes of others. Successful headlines often highlight a problem for your target audience and suggest a possible solution exists in the content. That’s because your brain is wired to focus on the negatives, with problems occupying our thoughts much more than the things that are going well. Sometimes a headline just needs the addition of bolder descriptions to make it stand out. Be careful, though. This practice leads to a kind of verbal “arms race” where certain adjectives get overused and become “salesy.” Make sure you stay ahead of the shifts in perception. These three rules are general enough that they apply to all headlines, but the specific tactics you use for each piece of content will be different every time. As your audience’s preferences shift, make sure that your headlines keep up. Don’t be afraid to test out new ideas. The only way to really know if one headline is better than another is to A/B test them. In the end, what matters most are the results that you get from any given headline and the content it introduces. So what do you think? What kinds of headlines have worked best for you? Let us know in the comments below!